I drove down to Knoxville, Tennessee today to run a few errands and decided to hit a couple of the bookstores on the west end of town. For those of you who haven’t spent much time there, Knoxville probably has more big bookstores than any other city of comparable size, and some cities much larger—so many, in fact, that a few years ago the local weekly ran a feature story asking whether the place could sustain them all. Anyway, while browsing around the area’s biggest used bookstore, I got slapped with a stunning reminder of the lopsided state of American military historiography. This place has a pretty substantial history section: world, European, U.S., regional, and so on. It has, also, a considerable military history section, which for some bizarre reason is on the other end of the store, nowhere near the other historical books. I’d guess that slightly more than half of the titles in the military section are Civil War books. World War II has the second biggest share, with a good selection of other twentieth-century and international topics. That would be King Philip’s War, King William’s War, Queen Anne’s War, King George’s War, the French and Indian War, the Cherokee War, the Revolutionary War, the Northwest Indian War, the Chickamauga conflicts, the Quasi-War, the Barbary naval actions, the War of 1812, the Creek War, the Black Hawk War, the Seminole Wars, the Texas War of Independence, the Mexican War, the battles with the Sioux and Nez Perce, the Spanish-American War, the Philippine War, a few interventions in Latin America and China, and various other little spats that flared up from time to time. So, are we gonna get to D-Day here, or what? A few days ago I posted a rather critical assessment of a Lincoln documentary that aired on the National Geographic Channel. I stated that the program was light on information, that it lacked focus, and that its use of contemporary images was questionable. Just FYI, this doc was made for a European audience and bought by NG to be re-authored for both a condensed version on Inaugural night, and a fuller version on President’s Day. It was originally called “Lincoln’s Last Night” and focused on the assassination. Most of that, the meat of it, was cut for the NG airing. The issues you brought up were addressed initially by yours truly when I first read the script, but because it was for a Euro audience, they became non-issues. Since the material was produced for an overseas audience, I was probably too harsh in calling it too basic and straightforward. Being an American, it’s easy to take the broad outlines of Lincoln and the Civil War for granted. The fact that this was originally an assassination documentary also makes some of the filmmakers’ emphases more sensible. The segment on photography, for instance, focused on Lincoln’s last photograph, and I’d imagine that the material on Civil War railroads originally tied into the funeral train’s journey from Washington to Springfield. While it seems my foot managed to find its way to my mouth, this whole thing does raise an interesting question: What is the current state of European knowledge about Lincoln and the Civil War? It’s a subject worth exploring in some detail, and I thank Mr. Klein for his comments. The good folks at the North Carolina Department of Cultural Resources sent me some information on an upcoming Lincoln event that I’m happy to pass along. It’s a symposium at the North Carolina Museum of History in Raleigh on Feb. 12th, featuring a display of some great archival material. Presenters include Joseph Glatthaar (author of an impressive study of the Army of Northern Virginia) and William Harris (who’s written a couple of really illuminating books on Lincoln’s politics). You can read the NCDCR’s press release below, but I also recommend that you swing by the event website for more details. RALEIGH – Both revered and reviled, Abraham Lincoln left a legacy that remains central to American 21st century life. In honor of his 200th birthday, the North Carolina Department of Cultural Resources, Office of Archives and History, will present “The Lincoln Bicentennial: A Symposium” on Feb. 12 at the North Carolina Museum of History in Raleigh, 10 a.m. to 5 p.m. with a reception following. The Abraham Lincoln Symposium will take a look at a variety of topics such as Lincoln as a political leader and as a wartime commander-in-chief. The Symposium’s all-North Carolina speaker roster of leading historians from five universities includes two winners of the coveted Lincoln Prize. A comparison with rival Jefferson Davis as President of the Confederacy will be highlighted in the morning session. After the 1863 Emancipation Proclamation, the Union Army began to recruit freedmen as U.S. Colored Troops, an idea championed in 1861 by Lincoln’s friend, former slave and prominent abolitionist Frederick Douglass, which will be discussed in an afternoon session. In honor of the bicentennial occasion, State Archives will exhibit several Lincoln documents from its collection; the display will be in the Museum of History. One document is from March 16, 1861, a letter sent to N.C. Governor John Ellis with the original Thirteenth Amendment, known today as the “ghost amendment” that would have denied the federal government the ability to intervene with slavery in any of the states where that condition existed. A $10 registration fee includes the closing reception. Information is available at www.ncculture.com and www.nccivilwar150.com. To register call Karen Pochala-Peck at (919) 807-7281 or (919) 807-7280. The N.C. Department of Cultural Resources is a state agency dedicated to the promotion and protection of North Carolina’s arts, history and culture. It is now podcasting 24/7 with information about the Department of Cultural Resources, all available at www.ncculture.com. Last night I caught the National Geographic Channel’s “The Real Abraham Lincoln.” I was sorely disappointed. It had to be the least informative Lincoln documentary I’ve ever seen, taking a dry and superficial “just the facts” approach that played out like Lincoln’s Greatest Hits. It breezed through the highlights of his life story with no real insight at all, telling the audience what happened without explaining or illuminating it. One of the things that irritates me about TV documentaries is their cavalier attitude toward imagery. They tend to throw up any photo or still shot that suggests something being mentioned in the narration, whether it really belongs there or not. NatGeo’s Lincoln program was no exception. When the voice-over related that Lincoln went to Springfield and joined a law firm, we saw a shot of the office building he shared with Herndon, despite the fact that he started this partnership well after he moved to the capital. Segments on Lincoln’s courtship with Mary Todd and the birth of his children included pictures from his presidency. And the guy playing Lincoln was an absolute dead ringer—maybe the most convincing I’ve ever seen—but he wore a beard throughout. These are seemingly minor matters, but they indicate a carelessness with the material that bothers me. Inexplicably, there were a couple of times when the narrative abandoned Lincoln entirely to discuss the role of railroads in the war and the development of photography. I think there was more time spent on these topics than on Lincoln’s response to the Kansas-Nebraska Act, or on his prosecution of the war in general. Anyway, if you’re thinking about tuning in when it airs again, you might want to skip it. On an unrelated note, yesterday was this blog’s heaviest day of traffic ever, by far. Go figure. I recently found out about a rather unusual genre of Civil War art which I just had to share with as many people as possible. As a young tyke I was an avid collector of the “Dinosaurs Attack!” bubble gum cards issued by the Topps trading card company. They were similar to the Mars Attacks cards from the ’60’s that inspired Tim Burton’s movie. The front of each card featured a painting of some poor sap—or group of saps—meeting a gory end at the hands of a prehistoric reptile. On the back was a newspaper story describing the scene depicted on the card. If you were a dinosaur-obsessed kid back in the 1980’s, this was just about the most fun you could have for twenty-five cents. Feeling nostalgic, I decided to get online and take a stroll down memory lane, when I discovered another super-violent card series that Topps cranked out in the ’60’s. It was, after all, the centennial, and the good people at Topps knew that the best way to get kids interested in history is to crank up the blood and guts. And thus the Civil War News card series was born. Check out Bob Heffner’s website to see them for yourself. The Port Republic card is my personal favorite, but “Death Barges In” and “The Cannon’s Victim” both deserve honorable mention. Alas, these cards were before my time; otherwise I wouldn’t have had to wait until college to discover the joys of history. Kunstler and Troiani, eat your hearts out. 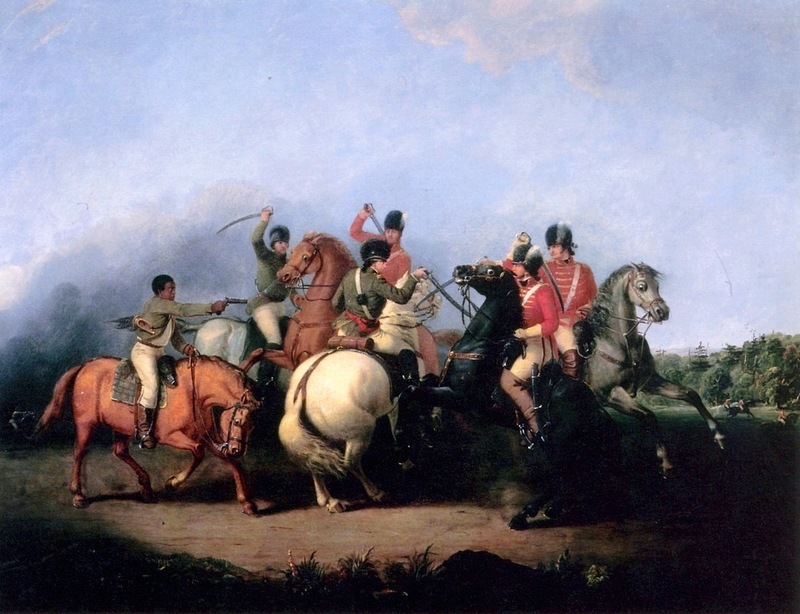 Today is the anniversary of the pivotal Battle of Cowpens, the Revolutionary War’s tactical masterpiece. Daniel Morgan’s Continentals and militia won a remarkably complete victory over Banastre Tarleton’s British dragoons and infantry. The trees in the background look more like something out of the African savanna than the South Carolina backcountry. For that matter, they wouldn’t be out of place in a Dr. Seuss book. Green eggs and ham, anybody? Tarleton’s dragoons were famous for their green coats, but here it’s the Americans who are decked out for St. Patrick’s Day. 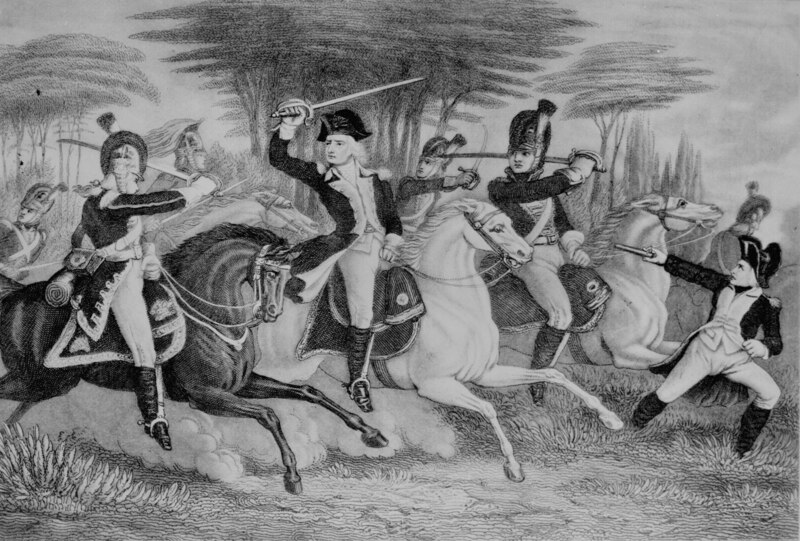 According to some accounts, just as a dragoon was about to slash Washington with his saber, Washington’s servant/waiter/bugler pulled a pistol and shot the trooper, possibly saving his master’s life. There are a few other depictions of this episode floating around out there, most of which take various liberties with the terrain, uniforms, and other details. Whatever their inaccuracies, they manage to capture the desperation that must have accompanied these eighteenth-century clashes of men, horses, and metal. As I’ve mentioned before, I’m teaching an elective course on the American Revolution for non-history majors this semester. Last night we discussed the taxation controversies of the 1760’s. We spent a lot of time on eighteenth-century notions of power and liberty, the fact that the colonists were predisposed them to see conspiracies and tyrannical plots with every exertion of government authority, and the violent response to the Stamp Act. I wrapped things up by explaining that although Parliament repealed the act in 1766, they also explicitly asserted their sovereignty over America, and mentioned that at our next meeting we’d explore the controversial measures Parliament employed after the repeal. And that, ladies and gentlemen, is just about the best and most concise summary of British imperial policy in the 1760’s that I’ve ever heard.